We are going to build a three-node active/active HA cluster using Pacemaker and Corosync. Our aim is to build a three-node (never trust clusters without odd numbers of voters) active/active GFS2 cluster using Pacemaker and Corosync. We have three CentOS 7 virtual machines on VMware (ESXi), named pcmk01, pcmk02 and pcmk03. The convention followed in the article is that [ALL]# denotes a command that needs to be run on all cluster nodes. The gfs2_tool command is not supported in RHEL 7. Make sure that the clocks on the GFS2 nodes are synchronised. Unnecessary inode time-stamp updating severely impacts cluster performance. NTP configuration is not covered in this article. iSCSI server installation and setup is beyond the scope of this article. It is assumed that you have a functional shared storage server in place already. You may want to check this post for an iSCSI target configuration on RHEL 7, you may find it helpful. 10.12.0.0/16 – non-routable iSCSI vlan. The vcentre record above points to our VMware vCenter server, which is on 10.247.50.10. This article uses Iptables firewall. Note that CentOS 7 utilises FirewallD as the default firewall management tool. -A INPUT -j LOG --log-prefix "iptables_input "
-A FORWARD -j LOG --log-prefix "iptables_forward "
SELinux is set to enforcing mode. Install rsync package, generate an SSH keypair and distribute it accross cluster nodes. # Nodes to keep in sync. # Files and directories to sync. # More files can be added as required. The pcs will install pacemaker, corosync and resource-agents as dependencies. Authenticate as the hacluster user. Note that authorisation tokens are stored in the file /var/lib/pcsd/tokens. Our Pacemaker cluster is now up and running, but with no resources configured yet. Cluster manager web UI can be accessed on https://pcmk01:2224/. The default settings for DM Multipath are compiled in to the system and do not need to be explicitly set in the /etc/multipath.conf file. However, the default value of path_grouping_policy is set to failover, so depending on setup, we may need to edit the /etc/multipath.conf file and change it to acoordingly. As we usually have an sda disk already in use on the servers, we’re blacklisting it. 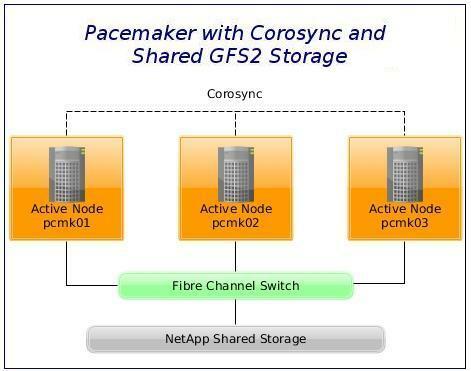 The commands below are specific to the NetApp Data ONTAP SAN which we have in use, and are therefore not explained in detail due to questionable benefit to the reader coming accross this article (emphasis on Pacemaker + GFS2). These are mostly for our own future reference. Note that the cluster property stonith-enabled may not be deactivated to use the DLM. Clusters with shared data need STONITH to ensure data integrity. Cleanup tells the cluster to forget the operation history of a stonith device and re-detect its current state. It can be useful to purge knowledge of past failures that have since been resolved. We want to prevent healthy resources from being moved around the cluster. We can specify a different stickiness for every resource, but it is often sufficient to change the default. The DLM needs to run on all nodes, so we’ll start by creating a resource for it (using the ocf:pacemaker:controld resource script), and clone it. Note that a dlm resource is a required dependency for clvmd and GFS2. Set up clvmd and dlm dependency and start up order. Create the ordering and the colocation constraint so that clvm starts after dlm and that both resources start on the same node. Set the no-quorum-policy of the cluster to freeze so that that when quorum is lost, the remaining partition will do nothing until quorum is regained – GFS2 requires quorum to operate. We will create LVM objects from a single cluster node. The above indicates that we have cluster locking enabled, but that the cluster LVM daemon (clvmd) is not running. Make sure it’s started via Pacemaker. GFS2 requires one journal for each node in the cluster that needs to mount the file system. For example, if we have a 16-node cluster but need to mount only the file system from two nodes, we need only two journals. If we need to mount from a third node, we can always add a journal with the gfs2_jadd command. GFS2 allows to add journals on the fly. When determining the number of nodes that our system will contain, there is always a trade-off between high availability and performance. With a larger number of nodes, it becomes increasingly difficult to make workloads scale. For that reason, Red Hat does not support using GFS2 for cluster file system deployments greater than 16 nodes. When deciding on the number of journals, one journal is required for each cluster node which is to mount the GFS2 file system. It is generally recommended to use the default journal size of 128MB. However, since our file system is very small (only 5GB), having a 128MB journal is simply impractical. It is also recommended that we do not run a file system that is more than 85 percent full, although this figure may vary depending on workload. In our particular case: 3 nodes x 32MB journals = 96MB + some space for resource groups = around 100MB. Create a clustered filesystem with three journals, where the journal size is 32MB. Note that the cluster name must match that in cluster.conf as only members of this cluster are permitted to use this filesystem. Acceptable locking protocols are lock_dlm, lock_gulm or if we are using GFS2 as a local filesystem (one node only), we can specify the lock_nolock protocol. [pcmk01]# pcs resource update gfs2_res01 options="noatime,nodiratime,rw,_netdev"
File systems mounted with the _netdev flag are mounted when the network has been enabled on the system. We may optionally want to check a GFS2 file system at boot time by setting the run_fsck parameter of the options argument. As per RedHat documentation, SELinux is highly recommended for security reasons in most situations, but it is not supported for use with GFS2. SELinux stores information using extended attributes about every file system object. Reading, writing, and maintaining these extended attributes is possible but slows GFS2 down considerably. We must turn SELinux off on a GFS2 file system (not on the whole server!) when we mount the file system, using one of the context options as described in the mount man page. We are going to change security context to public content, only one security context per filesystem. Files labeled with the public_content_t type allow them to be read by FTP, Apache, Samba and rsync. Files labeled with the public_content_rw_t allow them to be written (some services, such as Samba, require booleans to be set before they can write!). Now, we need to make sure that the cluster LVM daemon (clvmd) is started before any attempt to mount the GFS2 volume, otherwise our logical device /dev/vg_cluster/lv_storage won’t be found as volume groups with the clustered attribute will be inaccessible. GFS2 must start after clvmd and must run on the same node as clvmd. All nodes must have the GFS2 filesystem unmounted before running fsck.gfs2. Failure to unmount from all nodes in a cluster will likely result in filesystem corruption. The gfs2_grow command is used to expand a GFS2 filesystem after the device upon which the filesystem resides has also been expanded. We may only run gfs2_grow on a mounted filesystem as an expansion of unmounted filesystems is not supported. We only need to run gfs2_grow on one node in the cluster. Note that we can run gfs2_grow with the -T flag to get a display of the current state of a mounted GFS2 filesystem. The number of journals can be fetched by gfs2_edit -p jindex. Do not execute this command when the file system is mounted. If a GFS2 file system is full, the gfs2_jadd will fail, even if the logical volume containing the file system has been extended and is larger than the file system. This is because in a GFS2 file system, journals are plain files rather than embedded metadata, so simply extending the underlying logical volume will not provide space for the journals. The gfs2_edit command is a tool used to examine, edit or display internal data structures of a GFS2 or GFS file system. This entry was posted in High Availability, Linux and tagged CentOS, Corosync, fence_vmware_soap, GFS2, iSCSI, LPIC-3, LVM, multipath, NetApp, Pacemaker, STONITH. Bookmark the permalink. If you notice any errors, please contact us. Have you any idea why am i getting this error. I have done althing like your post. This is Erro Log in /var/log/message log file. Does it fail when calling fence_vmware_soap from the command line? Try it and see if you get a list of nodes available. Ensure the username and password are correct. I had the same issue, in case anyone else stumbles on to I resolved by populating the pcmk_host_list with the VMware UUID for the nodes as opposed to names. What happens when you try to activate it on the second node? The command completes, the lv stays inactive. Anything in logs? What shared storage do you use? If I do a “lvs” on node2, the volume and volume group show up, “lvscan” shows the lv as inactive so I’m assuming that’s the cause for the error. OK, one of the cluster nodes (kvm-node2) is unable to see the shared storage assigned to the OS, so I take it the shared storage devices were not shared correctly between the cluster nodes. /dev/mapper/mpatha is where I created the physical volume/volume group from. So from that standpoint it looks like it can “see” the volume? If your fdisk output is correct, then the node2 second node cannot see the /dev/mapper/cluster_vm_group-cluster_vm_volume. Why is that? What does “multipath -ll” show on both nodes? OK, it can see physical devices, that’s cool. Pls, respond me as soon as possible ! Yes, using GFS2 in a cluster requires hardware to allow access to the shared storage (iSCSI in our case). But your post have not section about iscsi server :(, can you update this guide ? about installation and cofiguration iscsi server ? iSCSI server setup is a separate subject, and beyond the scope of the article really, with the exception of several references to the NetApp SAN that we use for iSCSI storage. It is expected that you have a working iSCSI server already, apologies if this got you confused. I’ve updated the article to make it clear. If you need to create an iSCSI server from scratch, you may want to take a look at this post about setting up and iSCSI target on RHEL 7. Once again, the post is about creating an active/active Pacemaker cluster on CentOS 7, if you’re setting such cluster up, you need to have some shared storage before you start. I’m so confused in step: NetApp Data ONTAP SAN: Create a LUN on and iSCSI Server. Can you detail this step ? What’s confusing about it in particular? You don’t need that part unless you use NetApp storage. VMware vCenter is a centralised management application that lets you manage virtual machines and ESXi hosts. Hi Bruce, sharing is caring, thanks very much! I’ve taken a look at your video tutorials, and they have a fair amount of useful info, however, quite a few bits (package installation etc) could’ve been fast-forwarded. Most people who take onto RHCA have RHCE level skills. Thanks for the feedback. Will take that into consideration. No worries, you’re welcome Bruce. Can any buddy help me from here . Just to clarify, this article is for GFS2, it does not use DRBD. Many things can go wrong while configuring clustering, therefore it’s hard to tell what was the exact problem in your case. It is however evident that the DRDB resource isn’t running, therefore you may want to re-do the configuration and check for any DRBD-related errors. i have check that drbd is running successfully .i did it manually fail over the drbd services and other services are working fine. but via pacemaker the drbd is not fail over automatically .can you please tell where is the issue.